The weather is horrible these days, so I was much surprised by short clearings developing around local midnight last night. These allowed me a short peek and photo session on comet C/2007 N3 Lulin. 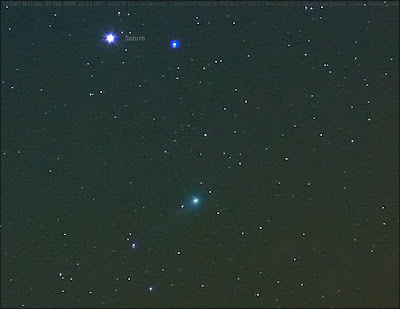 In the ETX-70 (small 7 cm refractor) at 14x, visually the comet was a nice fuzzy ball with a tail in NW-SE direction. Easy to find, especially as it was only a few degrees from Saturn. I had only a short window of opportunity to photograph the comet before clouds came in again. Below image is a stack of 24 x 10 second exposures, made with the Canon EOS 450D (@800 ISO) and EF 50/2.5 Macro lesn (@ F2.8) between 23:18 and 23:26 UTC (23 feb). Note that the conditions were far from perfect: not the best of skies, the comet low in the sky (35 degrees), and in the middle of Leiden town! So I am happy with the result. Hi Marco. I have a question for you not Lulin-related. 15 mins ago I went outside to see Lacrosse 5 sat passing overhead (85 deg elevation). When it was about 25 deg elevation, from NW I spotted a satellite flare. I went inside to check what Iridium was, but NO IRIDIUM. Some other sat produced the flare. It was about -1,5 magnitude. My coordonates are 45.5303N,25.7908E. The flare was between 17:27 UTC and 17:32 UTC today, Feb 26. Hope you can help me finding what sat was. @ Eduard: you mean february 25? Checked now in www.heavens-above.com and have no idea. There was a cosmos passing at that moment, but never seen a cosmos flare, at best it flashes. Are you sure it was kind of an orbiting speed and pattern? Check here for possible weather sounding launches. Also, it was really tight after sunset, could it have been an aircraft? Yes,25,my mistake. I think no aircraft because it was a true flare. It was almost parallel with the horizon in the NW direction. I saw that SKYMED sats can flare, and with SKYMED 2 passing at that time aprox. in that direction (azim,el) I was thinking that the flare was produced by SKYMED 2.